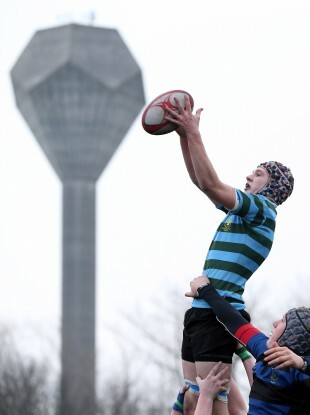 Gerrup: Alan Symes of St Gerard's claims a lineout against Mount Temple in the Vinnie Murray Cup. One to watch: Get yourself into Six Nations mode by watching the Wolfhounds against England Saxons tonight. One to Sky+: Late Sunday risers will want to set the box to record the men’s singles final at the Australian Open. It’s an early start if you want to watch it live. One to skip: Unless you’ve insomnia, it won’t be worth staying up for the Pro Bowl on Sunday night. Save yourself for the real deal next week. Basketball: SuperLeague Cup Finals, UL Huskies v Team Montenotte Hotel Cork and Bord Gáis Neptune v UL Eagles (Setanta Ireland from 6.30pm); We Got Game (documentary, Setanta Ireland, 10.30pm); NBA, Memphis Grizzlies v Brooklyn Nets (ESPN, 1am Sat). Cricket: South Africa v New Zealand, third one-day international (Sky Sports 1, 12.30pm). Cycling: The Tour Down Under, stage five (Sky Sports 1, 12.30am Sat). Golf: European Tour, Qatar Masters (Sky Sports 2, 9.30am); PGA Tour, Farmers Insurance Open (Sky Sports 3, 8pm). Skiing: Ski Jumping, World Cup meeting from Vikersund, Norway (Eurosport, 5pm). Snooker: World Snooker Shoot-Out (Sky Sports 2, 6pm). Soccer: African Nations Cup, Zambia v Nigeria (Eurosport, 2.45pm), Burkina Faso v Ethiopia (ITV4 5.30pm and Eurosport 6pm); Bundesliga, Borussia Dortmund v Nurnberg (ESPN, 7.30pm). Tennis: Australian Open (Eurosport, 8am). Athletics: International Match, indoor meeting at the Emirates Arena in Glasgow (BBC1, 1.30pm). Cricket: Australia v Sri Lanka, First Twenty20 (Sky Sports 1, 8.30am); India v England, fifth one-day international (Sky Sports 1, 3am Sun). Cycling: The Tour Down Under, final stage (Sky Sports 2, 2.30am Sun). Horse Racing: Leopardstown (RTÉ 2, 1.30pm); Cheltenham and Doncaster (Channel 4, 1.30pm). Golf: European Tour, Qatar Masters (Sky Sports 3, 8.30am); PGA Tour, Farmers Insurance Open (Sky Sports 3, 8pm). Rugby Union: LV= Cup, Sale v Scarlets (Sky Sports 1, 2.30pm). Tennis: Australian Open (Eurosport 8am and BBC2 8.25am). Skiing: Alpine Skiing, World Cup meeting in Maribor, Slovenia (Eurosport, 11.45am); Nordic Combined Skiing, World Cup meeting from Klingenthal, Germany (Eurosport, 2.15pm); Ski Jumping, World Cup meeting at Vikersund, Norway (Eurosport, 3pm). Snooker: World Snooker Shoot-Out (Sky Sports 2, 12 noon and 6pm). Soccer: FA Cup, Stoke v Manchester City (ITV1, 12.10pm); Manchester United v Fulham (ESPN, 4.3opm); African Nations Cup, Algeria v Togo (ITV4, 5.30pm and Eurosport 5.45pm); Serie A, Juventus v Genoa (ESPN, 7.45pm); Ligue 1, Rennes v Marseille (Setanta Ireland, 3.45pm); Serie A, Juventus v Genoa or Atalanta v Milan (Setanta Ireland, 7.40pm); Primera Division, Real Zaragoza v Espanyol and Deportivo La Coruna v Valencia (Sky Sports 1 from 8pm). Basketball: NBA, Boston Celtics v Miami Heat (Sky Sports 2, 6pm); Los Angeles Lakers v Oklahoma City Thunder (Sky Sports 2, 8.30pm). Golf: PGA Tour, Farmers Insurance Open (Sky Sports 3, 6pm). Hockey: Indoor Hockey, Men’s Indoor Super Sixes Premier Division semi-finals and final (Sky Sports 2, 3pm). NFL: Pro Bowl, from Aloha Stadium in Honolulu (Sky Sports 1, 11.30pm). Skiing: Alpine Skiing, World Cup meeting in Maribor, Slovenia, women’s slalom (Eurosport, 11.45am); World Cup meeting in Kitzbuhel, Austria, men’s slalom (12.15pm); Ski Jumping, World Cup meeting at Vikersund, Norway (Eurosport, 1.15pm). Snooker: World Snooker Shoot-Out (Sky Sports 3, 2pm and Sky Sports 4 7pm). Soccer: FA Cup, Brentford v Chelsea (ESPN, 10.45am); Leeds v Tottenham (ESPN, 2pm); Oldham v Liverpool (ITV1, 3.30pm); Clydesdale Bank Premier League, Aberdeen v Hibernian (Sky Sports 1, 12 noon); African Nations Cup, Morocco v South Africa or Cape Verde v Angola (ITV4, 4.30pm and Eurosport 4.45pm); Serie A, Inter Milan v Torino (ESPN 7.15pm); Bundesliga, Stuttgart v Bayern Munich (ESPN, 4.30pm); La Liga, Primera Division, Barcelona v Osasuna and Athletic Bilbao v Atletico Madrid (Sky Sports 1, 6pm); Ligue 1, Paris Saint-Germain v Lille (Setanta Ireland, 7.45pm). Tennis: Australian Open (Eurosport 8am and BBC2 8.15am).